Less than a week after Microsoft finally launched an iteration of its Office productivity suite for iPhone users in the US, the software giant has made the app available in the UK. 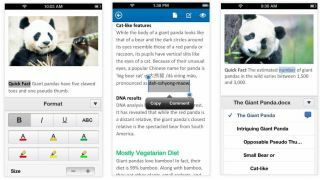 The Office Mobile app allows Office 365 subscribers to and view and edit Word, PowerPoint and Excel documents, with any changes synced back to the cloud. However, Microsoft's offering is of no use to users without an Office 365 membership (£7.99 a month or £79.99 a year), as it requires a log-in or purchase to get past the first screen. Also, as Microsoft revealed on Friday, the app is not compatible with the iPad and there's no sign of the tablet-friendly version on the way. The iPhone version also fails to accomodate Outlook or OneNote. The Office app arrived on Friday in the US following months, nay, years of speculation over its future on mobile devices. Microsoft has continually held off on launching the suite as it attempted to push Office as a Windows Phone-exclusive feature, while also looking to establish Windows-based tablets as iPad alternatives. Now it has caved slightly having realised iPhone access may drive sales of its Office 365 subscriptions, which also give users access to the software on multiple PCs, Macs and mobile devices. Now it's finally here, the need for a subscription will limit how well the app is received and it's somewhat somewhat disappointing that the app doesn't offer any free functionality through SkyDrive. However it's tough to blame Microsoft for refusing to give away anything to those who've chosen Apple rather than its own products.